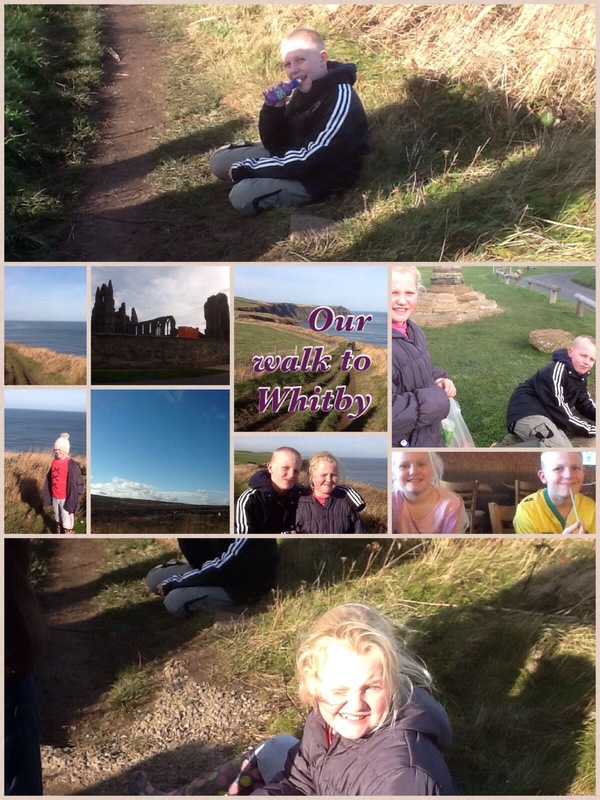 Today we walked about ten miles and ended up in Whitby. The holidays are great, I hope all our WCM children are having a good time as well! On Saturday 19th October, WCM hosted the second cross country race of the season. The weather just about held off for us and despite the recent heavy rain, the course also held up well! It was a resounding success and an amazing team effort from all those who came to help and support and our WCM runners. Many people commented on the day about what a well organised event it was and what a ‘proper’ cross country course it was. Around 30 of our staff, families and friends were on site by 8am making sure everything was in place and clearing up afterwards. I think the area had less litter than when we started and certainly less ‘dog mess’ thanks to Mr Gill’s early morning removal exercise!!! All the runners did themselves proud! They all finished and finished strongly, they supported each other and many achieved a PB with a top 10 finish for Megan in the Y4 girls race and top 5 finish for Lucien in the Y4 boys! Mrs Graham and her team also did a fine job selling drinks and food and raised between £150-200 for school. It was also lovely to see Mrs Kingdon who was in Sheffield over the weekend and came along to cheer on and be our VIP marshal! Thanks to everyone who was a part of the event and made it such a triumph! Mrs Bradley and I would like to say a huge thanks to all the parents who came along to the talk and discussion in the hall on Friday. We were really pleased not only with the number of people who came but also the level of support you showed for our school and some of the excellent questions that you asked. 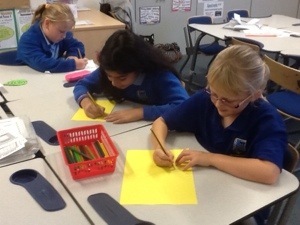 We definitely do not want to change our school uniform – shirts and ties are not for us! We said at the meeting that increasingly there are greater advantages to becoming an academy than staying with the Local Authority where support is diminishing at a fast pace. Quite a number of parents said that they would be interested in being part of a parent forum who would like to play a role in moving forward with the discussions and finding out about the best academy sponsor for WCM. Look out for information in the Green Un but in the meantime, please come and see us if you have any questions or concerns. 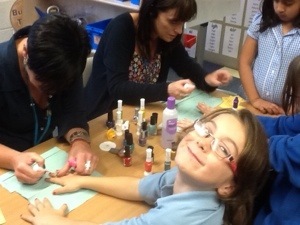 Go along to Girly Time and have your nails done! Or have fun at Art Attack! 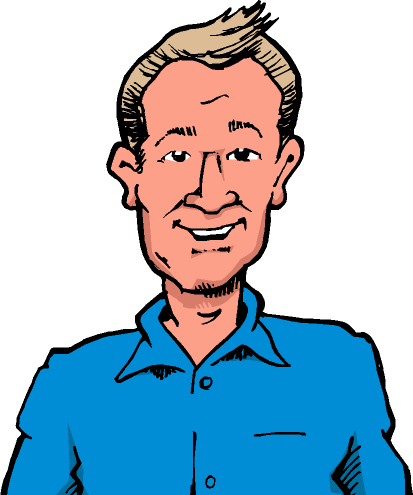 Next week I will show you some more activities. We would like to say an enormous thank you to all our families who brought produce in for our Harvest collection. 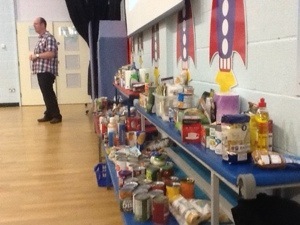 Chris from the food bank based at the Community Centre came in to assembly today to say thank you. Parent Meeting & A Bacon Butty! We would like to remind you about our information meeting here at WCM on Friday 18th October at 9.15am in the hall. As you will have heard in the news there is lots of talk about Academies and changes to how schools are run. You may also have noticed that Longley Primary is now part of the E-Act chain of academies (who also run Parkwood) and has changed its name to Pathways Academy. We would like half an hour of your time just to discuss the changes and answer any questions you may have about WCM. It is really important for us to hear your voice so that we know the views of the families we work so closely with. Please come along to see us! Yesterday (Thursday 10th October), a dance teacher from Longley College and five of her students came in to work with a select group of our Y4, 5 and 6 pupils. The dance they put together and worked on over the course of the day was amazing. The ‘WCM Crew’ performed their new routine to an ‘open-mouthed’ Phase 1 at the end of the day and will be performing again in today’s Phase 2 & 3 assembly! Jo, the dance teacher, reported that the children had been fantastic to work with and were a real credit to our school. They have certainly got some dancing talent!